The office of Georgia Ear, Nose & Throat Specialists is a comprehensive center of excellence for the diagnosis and treatment of ear, nose, and throat disorders. In addition to general otolaryngology, the Georgia Ear Institute provides specialized services in neurotology, pediatric otolaryngology, endoscopic sinus surgery, facial plastic surgery, and allergy. Our licensed audiologists provide diagnostic hearing and balance testing in addition to comprehensive hearing rehabilitative solutions. The latter include a broad range of hearing aids for adults and children, bone anchored hearing aids, totally implantable hearing aids, cochlear implants, and semi-implantable hearing aids. Savannah Vascular Institute offers the only dedicated office-based vein centers and access centers in the region. 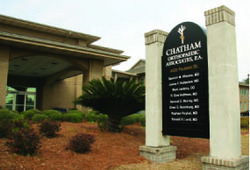 Chatham Orthopaedic Associates, P.A. is the oldest orthopaedic medical practice in Savannah. SouthCoast Medical Group is the largest, local physician-owned, multi-specialty healthcare practice in Southeast Georgia. Dr. Richard Thomas provides patients with excellent dental care in a comfortable and inviting environment.